The best infographics may look like they were simple to create, but designing an effective piece of data visualisation is anything but. So why go to the effort of creating an infographic? Well, they say that every picture tells a story, but sometimes it takes a clever combination of words and images to tell a story quickly, concisely and in an entertaining fashion. Most importantly, great infographic design can translate complex data into something everyone should be able to understand at a glance. There are no hard and fast rules when it comes to designing infographics. However, there are several great infographic tools, which will help get you off to a great start. And these examples of infographics from around the web will show you how you can take things a step further and add a bit of style and personality to your data. We'll kick off with some awesomely meta infographics about infographics, before moving on to the best infographics for giving instructions, explaining a process and more (use the quick links on the right to jump to the section you want). Hopefully our picks will give you plenty of inspiration for designing great infographics for yourself. The popularity of infographics shows no signs of slowing down, but why are they so popular? This infographic by NeoMam Studios explores exactly what it is about infographics that hits the spot. It's also beautifully designed and brilliantly executed. An online experience built with HTML5 and CSS3, you can check it out in all its interactive glory if you click the image above. "The parallax scrolling effects were probably the most difficult to achieve," says Neo Mam's Danny Ashton. "Our developers looked at the available libraries and described them as a bit 'wonky', so they ended up creating their own instead." Besides that, says Ashton, the challenge in building the infographic was to keep the CSS as simple as possible. "We wanted a smooth, user-friendly experience," Ashton explains. "That was more important to us that doing loads of 'tricks'." While on our travels across the world wide web, we landed at InfoBrandz site and found this – yes, it's an infographic that explains how to make the best infographic around. If you're interested in designing an infographic but you're not sure what you'd like it to be about, this will get you started with some ideas for themes. 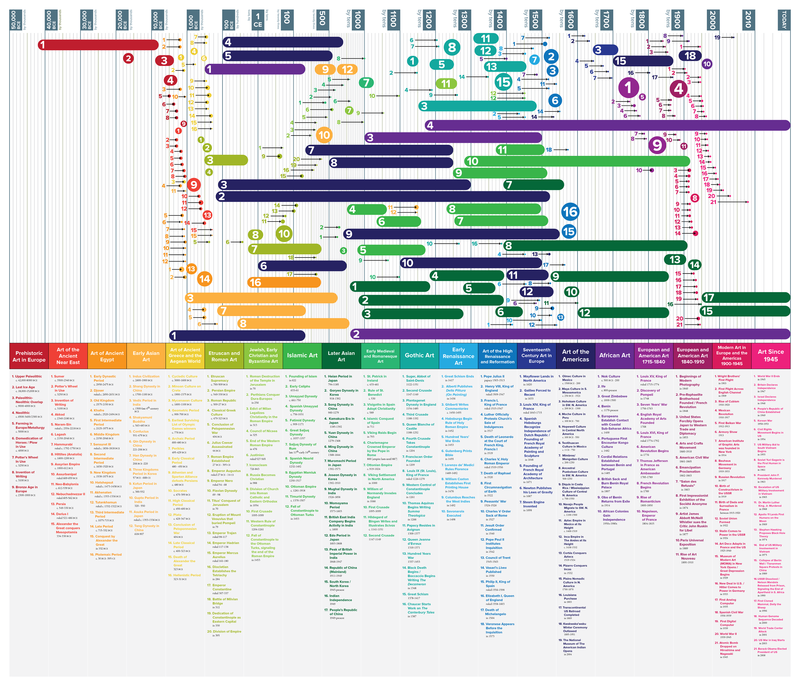 It also explores what topics infographics work well for. Did the title confuse you? Us too. What this infographic does is to unpick the trend for infographics and explore the stats surrounding the trend. If you're looking to design your own, this will show you what fonts are popular, how many sections are typically included, what themes tend to crop up, and more. What better way to explore a world than by exploring our world – life on planet Earth. 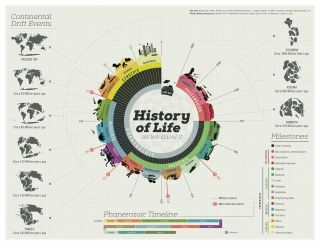 This gorgeous infographic by Juan Martinez defines each geological era of the world, the changing shape of the land continents, and includes timelines, life milestones and mass extinction events. It is also available to buy as a print. UK-based portrait specialist Sam Gilbey has produced various pop-culture-universe-exploring infographics over the years, including this design dedicated to 50 years of Doctor Who. His other lavishly illustrated creations to-date range from a stat-based comparison of four Avengers characters; to the 85th Academy Awards in numbers – all created for Virgin Movies. All off these three infographics are excellent examples of using illustration to add interest and shareability to a list of facts and figures, rather than analysing the data per se. Another prolific infographic creator, UK-based design studio Dorothy has carved something of a niche in creating highly desirable infographic-style posters. Its designs often chart the many complex connections between entertainment genres and sub-genres, and are perfect for any superfan to display on their studio walls. Stand-out examples include the 'blueprints' series, exploring the history of hip hop, alternative and electronic music over the decades; the 'colour wheel' series, dedicated to the colour palettes of movies, books and music; and 'star charts', which map the relationships between seminal films, actors and directors. They all share a stunning design aesthetic, ultimately driven by data. The winner of an Information is Beautiful award, Valentina D'Efilippo's creative visualisation of the iconic Bowie track Space Oddity contrasts Dorothy's expansive genre-spanning creations by opting to go narrow and deep instead. 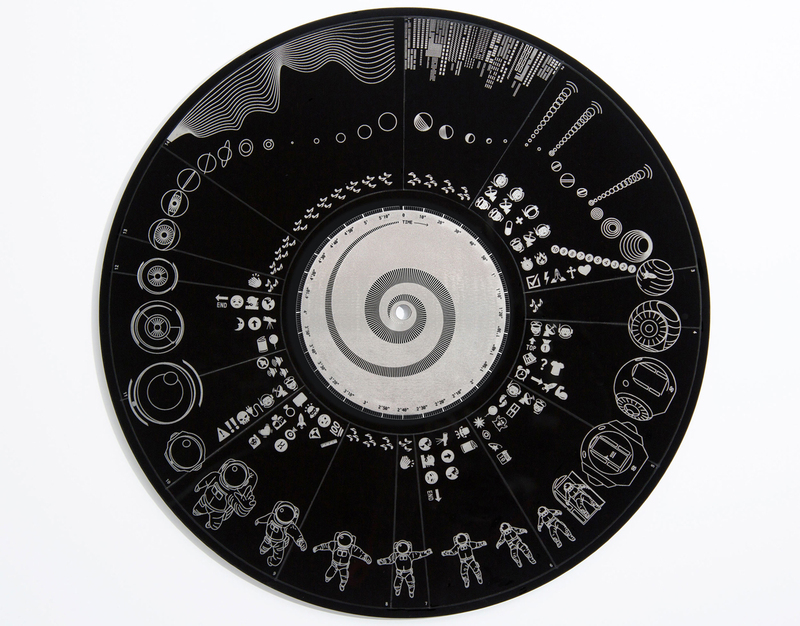 D'Efilippo worked with researcher Miriam Quick to gather data about the track, which she then visualised as a series of 10 12-inch discs, each of which deconstructs the track in a different way: according to melodies, harmonies, lyrics, structure, story and more. 08. An analysis of The Beatles? Music-loving data nerds will get a kick from this ace interactive infographic analysing the career of the Fab Four, breaking down their career by year and by album and providing plenty of insight into who wrote what, which Beatle had the biggest vocabulary (hint: it wasn't Ringo), what most of their songs were about and much more. If the latest Star Wars film has put you in the mood to immediately watch the original movie, hold your horses just one second. Rather than sit through Episode IV again, why not enjoy it in infographic form? SWANH.NET is a project by Swiss illustrator Martin Panchaud, in which he's adapted Star Wars: A New Hope into a 123-metre-long infographic. Created in Illustrator CC, using 157 pictures across 22 separate files, it took him over a year to produce. 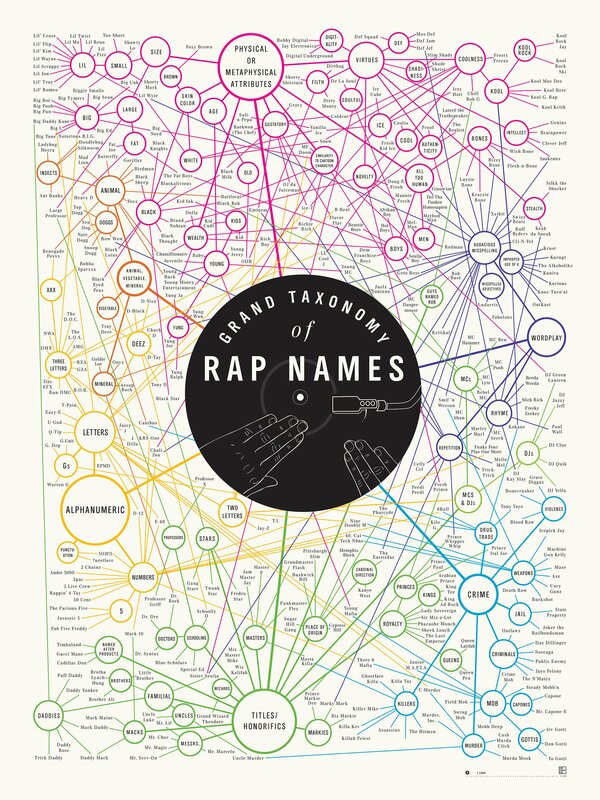 This colourful infographic examines 282 rap names in startling detail. Our favourite section? 'Audacious spelling' – with sub-categories of 'Improper use of K' (hey OutKast) and 'Misspelled adjectives' (that's you, Ludacris). It was brought to you by Pop Chart Lab – a company set up by a book editor and a graphic designer who joined forces with one modest goal in mind: to render all of human experience in chart form. The multitude of varieties, brands and tastes of beer available can sometimes be a little overwhelming. So what better way to showcase the taxonomy of beer than with an infographic? Another one from Pop Chart Lab, this infographic is a 60x40in and called The Magnificent Multitude of Beer. It ended up being so big that the team had to enlist the help of another printing firm to handle the job. After all that hard work, let's hope they found time to head to the bar. We weren't exactly sure which category to put this interactive infographic in. It explores a trend and a movement – the #MeToo movement to be precise, and includes a timeline. But as this movement affected so many people around the world, we thought adding it in the 'explore a world' category seemed appropriate. This infographic is from Valentina D'Efilippo and focuses on the first six months of the #MeToo movement, analysing around 200,000 tweets from that time, and displaying all this with various gorgeous visuals. You can read more about the project in our post. Another timeline, and this one is a winner with us because of its popping colour, bold lines, and subject matter. Created by Matthew Cobrin for an Art History class during his undergraduate career at The New England Institute of Art in Brookline, Massachusetts, the graphic met the brief by displaying "a massive amount of information through a timeline that's minimal and vivid". This infographic breaks down facts about the superheroes that feature in Marvel's Avengers Assemble. You can find out about each character's strength, skills, brains, gadgets and heart via few handy pie charts. The results are then compiled to show the team's greatest collective strengths. The character designs and clear presentation really help this infographic shine. We love this simple but beautiful infographic for Christopher Nolan's 2010 blockbuster movie Inception. Let's face it, given how complex the film is, a little bit of simplicity to explain it goes a long way. The illustration was created by New York-based graphic designer Rick Slusher, his elegant summary of the film depicting each character as a coloured line; the layers of dreams depicted as concentric circles. An essential career skill for designers of all levels is the ability to explain your work effectively, and articulate your vision to clients. Fortunately the design industry is shaped by a glossary of terms that explain the technical thinking behind creative decisions, as this infographic from DesignMantic reveals. A neat piece of design work in itself, this beautifully illustrated ABC of design runs through 26 key words every designer needs to know and turns their meaning into stylish graphics. This is one of the best infographics we've seen covering user interface, or UI design. Designmantic has come up with this go-to graphic to help you get your website interface just so. Appropriately, a lot of thought has gone into the design, too – it's broken down into colour-coded themes (create a story, ensure accessibility and so on), with simple icons to convey the key rules within in category. It's well worth a look wether you're after UI design advice or inspiration on how to design an effective infographic. Do you know your aperture from your apex? How about the difference between a finial and a flag? If not, then this typography terms infographic acts as a handy cheatsheet that will help you get up to speed. It contains all the usual suspects, plus plenty more – only a true typography pro will know all of these, so take a look to fill in the gaps in your knowledge! After more information? Take a look at our roundup of the best typography tutorials. Creative droughts are the stuff of nightmares for artists, designers, photographers, and just about anyone with an imagination. But how do you reignite your creative spark when all you want to do is give up? Designed by the team at Creative Market, this colourful list of 40 inspirational tips contains advice that artistic greats have turned to in times of need. And if these don't work, have a look at our list of ways to overcome a creative rut. Designmantic are the team behind a few of the great designs you'll find in this list. This particular infographic breaks down the key rules you need to know to create all-important visual hierarchy in your data – from using the golden ratio to implementing grid theory to bring balance to your work. This infographic from Evan Brown at DesignMantic is a typography nerd's dream. If you've ever found yourself aimlessly scrolling through lists of the best free fonts, this cheatsheet will help you refocus your search by providing you with some key rules. "Even though typography is an art and art is supposed to be subjective with minimal parameters, these rules can still be applied in order to save time and too much experimentation," he explains. "It's always good to know the few basic dos and don'ts in order to save yourself the trouble of experimenting with too many fonts on your design."